The Chignecto Isthmus: New Brunswick to Nova Scotia linkage area is a narrow, 23 kilometer strip of land that joins mainland Nova Scotia to New Brunswick and the rest of the continent. The Isthmus has two distinct coasts—to the northeast is the Northumberland Strait and to the southwest is the Bay of Fundy. The towns of Amherst, NS and Sackville, NB are located on the Isthmus itself. Springhill and Oxford NS are to the east, and Shediac, Dieppe and Moncton NB are located just to the west. The Isthmus is an important transportation corridor with the Trans-Canada Highway and inter-provincial railway crossing over it. And it is also the only route for terrestrial wildlife to move in and out of Nova Scotia. Without deliberate planning to conserve ecosystem connectivity, development on the Isthmus could restrict the natural movement of plants and wildlife across this important land bridge. 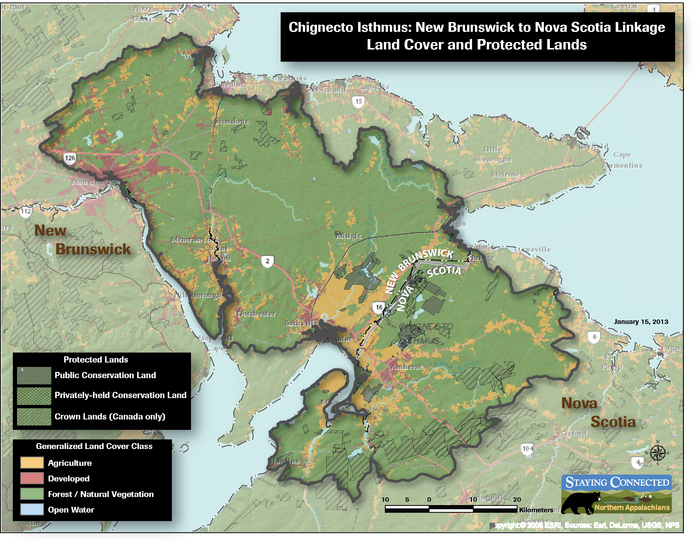 Read more about the Chignecto Isthmus.